Another stunning Wimbledon final, with Roger Federer falling short. He had won five successive games from 5-2 down in the fourth set, saving match points to level the match and look stronger at the start of the fifth. So how did Djokovic pull it out of the bag? In the 2012 US Open final Djokovic had come from two sets down to level the match before losing the decider to Murray. Murray had taken a toilet break at the end of the fourth and has said that he looked himself in the mirror and was determined to give it his all in the fifth and ended up winning the decider 6-2. So what was Djokovic’s story as he to took a toilet break having just lost the fourth set? It’s not unusual for players to take a toilet break at key moments. In warm weather, out on court it is unlikely that they have the physiological need but it does give them more time to collect their thoughts, or perhaps to disrupt the rhythm of the player with the momentum. Djokovic was asked later whether he had, like Murray, looked himself in the mirror but his response was that he spent plenty of time looking at the toilet! What he went on to say was revealing though. He said that he was determined not to let Roger see how he was feeling and to be sure that he puffed his chest out and held his shoulders up. He clearly felt wretched, not surprising having lost five games in a row and lost match points. However, what he was doing provided the platform for him to get back into the match and go on and win. It is often said that our psychology affects out physiology, i.e. our body language betrays how we feel, however, it has been shown that it also works the other way – our physiology can affect our psychology. 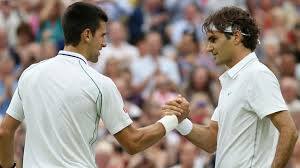 Indeed this was one of the factors that helped Djokovic – holding his posture, being determined not to let Federer see how he must have felt at the start of the fifth set will have affected Djokovic’s mind positively and helped him get back. This can help us also, as we prepare for difficult meetings or might not be feeling great about ourselves at work, changing our minds can start with changing the way we hold ourselves.